The 2013 event took place on Saturday 9th March at Yarty Farm, Membury by kind permission of Mr L Dugdale and Mr F Pearce. Another good turnout with 90 people laying the competition hedges. 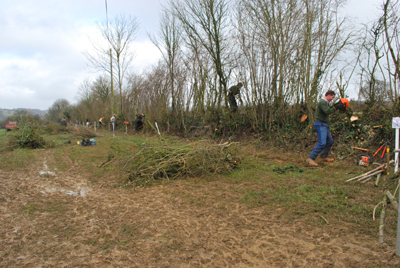 Unfortunately the dry weather broke the Wednesday before the competition so the crowds were smaller than the previous year but the event was still lively with much interest shown in hedgelaying and the various other attractions. Best veteran competitor (aged 60+). Best regrowth of a length from the 2012 competition.